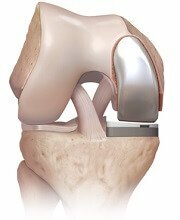 Partial knee replacement recovery will vary from person to person but is generally very good with 92% of partial knee replacements lasting at least twenty years. If you are about to have a partial knee replacement, be encouraged. People are usually up and about really quickly after surgery and are home within a few days. You can usually get up the same day as your operation and can start rehab immediately. Here we will concentrate on recovery from partial knee replacements, looking at short term recovery over the first week and longer term recovery over the first few months. We will also look at what rehab involves and how successful surgery is. The information here focuses on partial knee replacements, where only one side of the joint is replaced. If you are having a Total Knee Replacement, visit the TKR recovery section instead. Partial knee replacement recovery is usually pretty quick. You are often able to get up and walk around just a few hours after the operation, if not the next day. You can usually put your full weight on the leg straight away, but you may need crutches or a stick to help for the first few days. You will start your exercises straight away and will progress through the rehab programme as instructed by your physical therapist. People are usually discharged home after 24 hours, but may be kept in for a couple of days if needed. The main focus in the first week of partial knee replacement recovery is for you to be able to get up and about independently gradually taking more weight on your operated leg, to get the knee moving as soon as possible gradually increasing the range of movement and strength, and to keep your pain under control. Within 3 months you are likely to be back to all your normal activities and extra ones as you will no longer be limited by your arthritis. You will continue to improve for up to two years after a partial knee replacement. Rehab is one of the most important aspects influencing partial knee replacement recovery. Both before and after surgery you will see a physiotherapist who will go through exercises with you. It is well worth starting these exercises before you have your operation to get your muscles stronger as you will recover quicker from the operation. After surgery, you will be able to progress onto more advanced exercises. Knee replacement rehab exercises help to increase the amount of movement at your knee, so you can bend and straighten it fully, as well as improving strength of your knee muscles and stability of the knee. These all help to make your daily activities such as walking and climbing stairs easier and less painful. Partial knee replacement recovery will be largely impacted by how much you comply with your rehab programme. If you exercise regularly, you should end of with a very strong, mobile knee that allows you to do virtually anything you want. If you don’t exercise your knee you run the risk of developing long-term stiffness and weakness in your knee which will affect day-to-day activities such as walking and climbing stairs. Visit the knee replacement exercises section for simple and effective exercises to do both before and after knee replacement surgery to help you get the best out of your new knee. Partial knee replacements are incredibly successful when done on the right patient. Surgeons have strict criteria to follow when deciding if a partial knee replacement is suitable to ensure they work and Physical Therapists are specially trained to help you make the best knee replacement recovery possible. Occasionally the fittings may come loose or arthritis may develop in the other side of the knee in which case a total knee replacement will be performed. For more information see the risks and problems page.